By Evelyn Hecht-Galinski, Sicht vom Hochblauen, 28 March 2018, English translation by Milena Rampoldi, ProMosaik. Full of disgust I think of this “total” new beginning the FAZ referred to by talking about this Auschwitz Minister Maas. I have seldom been so disgusted by the political unilaterality of this traumatised foreign minster. So, I feel forced to write about him again; about this minister grew like his suits. 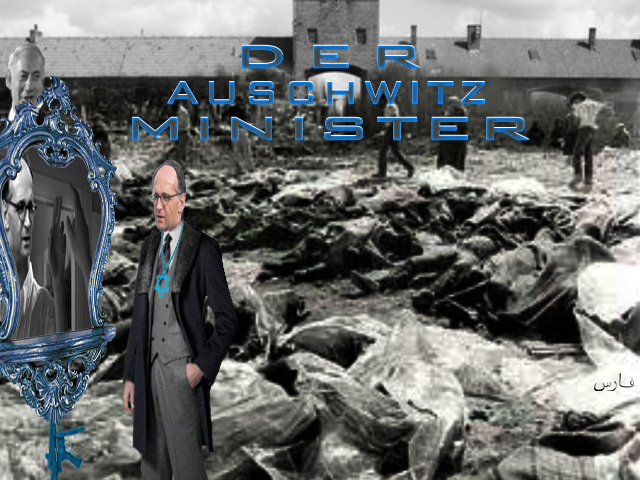 “The Auschwitz Minister” was the first minister (for justice) celebrating “Chanukkah” in his ministry – imagine in whose company – and who will also celebrate Pessac which this year coincides with Christian Easter after his return from the “Holy Land”. I am asking myself now when this philosemite minister will convert, let himself be circumcised and celebrate his Bar Mizwa in the ministry with Charlotte Knobloch as honour guest? Before starting his flight to the “Jewish State” he emphasized his connection with Israel. As expected by a minister who entered politics “because of Auschwitz”, after his arrival to the “Jewish State”, he had nothing more urgent to do than re-visit the Holocaust Memorial Place Yad Vashem, accompanied by the former president of the Central Council of Jews in Germany, Charlotte Knobloch. In addition to Knobloch, two “particular” journalists, one of the Bild newspaper owned by the Zionist Springer and one of the Jüdische Allgemeine, the “storming” central organ of the Central Council of Jews, were part of his illustrious entourage. This is the expression of press diversity. This choice says it all about this “new beginning”. Heiko Maas is the Foreign Minister who strikes a smarming note towards the Jewish occupiers’ regime as it is his personal mission. My question is: How personal can official foreign politics be? Is the politician of the Social Party the right one for this job? He explains his Auschwitz statements to about 30 Holocaust survivors in Israel and cares about his own family history during the Nazi regime. However, even if he looked for resistance fighters, he just found hangers-on. Therefore, he began to care about the contribution he could make so that this will never happen again. However, if for Maas the Shoah is a reminder and mission to engage for human rights and tolerance and to oppose to any kind of Antisemitism and racism, he does not do justice to this mission and is more than hypocrite. He is himself a “hanger-on” of the politics of the Zionist state terror regime violating international law. Instead of standing for the Palestinian people and opposing to the illegal occupation of Palestine, our foreign minister pays courts to Israel. As German foreign minister he will go down in history, as during his first visit to the “Jewish State” he did not even mention the term “settlement politics”! It is unbearable to look at how he smarms over Netanyahu: when it comes to the dangerous politics about the nuclear agreement with Iran he just mentions that there are “different conceptions”. This confirms our best fears. Maas does not raise his voice for the liberation of Ahed Tamimi, one of many children and young people arbitrarily imprisoned by the Zionist regime. He does not raise his voice for the journalists and other innocent Palestinians who struggle for the freedom of Palestine. What a shameful “new beginning”! His hypocrisy is also reflected in his double standards: Russia is punished for its alleged participation to the poison attack against a double agent, while the “Jewish State” which has been violating international law for decades now is justified. What a shameful “new beginning”! Instead, Maas should check how his family acted during the war against Russia and how many of the 27 million Russian citizens the Mass hanger-on are responsible for! In the coalition contract it is stated that the actual Israeli settlement policy opposes to the applicable international law and must not be supported because it complicates the two-state solution. However, we have to ask ourselves how this is compatible with the German reason of State for the “security of the Jewish State” and the resulting consequences. “Complicated” is a totally inadequate term for this severe violation of international law making the foundation of the State of Palestine impossible: the illegal occupation since the Six-Day War in 1967, the continuous land grabbing by the settlements, the annexation of East-Jerusalem, and the recognition of Jerusalem as the “undivided capital” by US president Trump, and the relocation of the US embassy to Jerusalem announced for the 15 May, emphasise the Jewish claim for whole Jerusalem. What will minister Maas do against this outrageous provocation? Almost nothing, I would say, if we consider that he is already preparing the celebrations for the 70th anniversary of the “Jewish State”, instead of commemorating the 70th anniversary of the nakba, the catastrophe, coinciding with the foundation of the state of Israel. Instead, the commemoration of the nakba would be the overdue German new beginning. Finally, Maas’ words written into the guest book of Yad Vashem “The commemoration should never end” should also apply to the nakba, the catastrophe of the Palestinian people beginning in 1948 and so closely connected with the Holocaust without which it could not even exist. The foreign minister also paid a short visit to Palestinian president Abbas in Ramallah, planned for his 83rd birthday. Instead of empathy, he brought a KaDeWe gift hamper with “Spree” gherkins and “German” fine foods. Maas did not have anything else to do than asking his Palestinian colleague Raid Malki in a rapid and more than unkind press conference to “invite” the Palestinians not to burn all bridges (to the occupation) in this “difficult” time and to request Palestinian “availability” to talk to the United States (as unilateral mediator!). For sure, this Abbas-“Vichy” government will listen to these impossible claims. (At the moment!) it refuses the “unique” mediator, after that it had recognised Jerusalem as Israeli capital. However, the Abbas regime feels committed to conduct direct negotiations with Israel and to continue to fight against terrorism and to aim at a “multinational mechanism” of political accompaniment – a woolly formulation by Malki. The whole thing sounds like the fake word “autonomous region” German media use to hide the occupation of Palestine, opposing to international law. Maas will not see anything of the misery in the illegally occupied regions, starting from the concentration camp in Gaza. Maas will meet with a pseudo-opposition. He will not meet NGO like Breaking the Silence or B`Tselem criticizing the military occupation and violations against human rights in the illegally occupied Palestinian regions. For sure, Maas will not attract Netanyahu’s irritation like his predecessor Gabriel he met on Monday afternoon after Netanyahu and his wife Sara had been interrogated again about corruption allegations. Despite the stuck peace process Maas also adheres to the mantra of the so-called two-state solution, although it is well-known that Netanyahu has always refused it by saying that the continuity of his Middle East policy applies. For me this means the continuity of hypocrisy applies! Has he not asked himself why in view of the aggressive illegal settlement politics which reached its record high in 2017 with Trump this Monday a new illegal settlement, Amichai, was inaugurated? What a Chuzpe! In this sense, I wish all readers and friends Happy Easter / Pessac. Again, this year in occasion of these celebrations our Palestinian friends under occupation will be “closed off”. This year also the 30th of March, on which three important data coincided on one day – what a symbolism! The Good Friday, the first Seder evening of the Pessac celebration, the Land Day, in remembrance of the massive Zionist land grabbing in Galilea in 1976, with many victims and injured Palestinians. We should think about it when we celebrate the festive seasons and memorial days in freedom and peace.